For 22" Single bar for 26 x 1.1/2 x 1.5/8 Endric Profile, with lugs for frame pumps. Finish Royal Blue/ Metalic Shade. We are dealing with Bicycle Frames. With an impressive growth record in this highly competitive industry, we are providing a qualitative range of Cycle Frame. 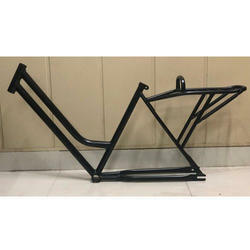 One can avail from us a wide range of Bicycle frames, also known as Cycle Frame, as we are one of the leading companies that manufacture these frames to meet the requirements of our clients. Our products are made up of premium grade raw material sourced from a reliable vendor in the market. These frames are well designed by the expert team and are highly demanded by our clients. 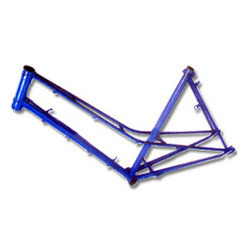 Being the leading names in the industry, we offer highly durable array of Modern Bicycle Frame that are acclaimed for high quality and smooth performance. Our entire product range is abrasion resistant in nature and has high tolerance capacity. They are easy to frame according to the individual requirements of our clients. Font Fork: Swagged blades 16 S.W.G. Tubular crown with C.P. - BMX Type U Shape 24 TPI Butted Stem & Blades for Wheel Size 16"/20" x 2.125"
- Twin Tube Type for Wheel size 28 "x ½", 24 TPI.